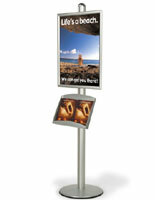 Snap Open Frames : This exhibition stand is part of our BRAVA Series of standing poster holders! 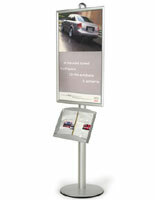 Draw attention to your advertisements with an 8ft exhibition stand! 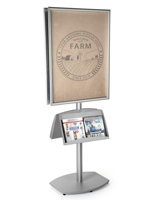 This exhibition stand includes one 24" x 36" poster frame and two literature trays for your handouts and catalogs. With a free standing display system like this exhibition stand, you can attract attention with a large poster and then encourage customers to take your information home with them. Offer your customers and visitors information about your company, product, special promotion or upcoming event! Although this exhibition stand is sold with one frame and two literature trays, you can also buy and add more accessories to your display. A modular display stand like this exhibition stand allows you to mix and match different pieces to create a truly unique look! With its tall stature and sleek design, this exhibition stand will not be missed! 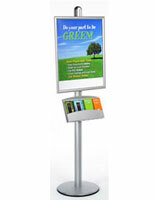 Each free standing exhibition stand is constructed of an 8ft aluminum pole and a strong, sturdy base. The steel literature holders are 18 ¼" wide, so they can hold 2 standard sized catalogs side by side. 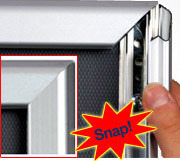 The 24" x 36" poster holder has a convenient snap-open frame that is great for holding signs, advertisements and other large graphics. 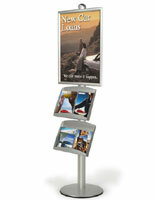 Grooves along the main poster display stand allow you to adjust the included frame and literature pockets to any appropriate height. To attach these accessories, loosely screw the connectors to the sides of each piece and slide the screw and connectors along the grooves. Adjust the frame and literature pockets to whatever height you desire and tighten the screws. Because of its height, this exhibition stand is easiest put together with two people. An eye-catching display system like this exhibition stand is perfect for retail stores, malls, conventions and sales offices. We sell this 8ft exhibition stand to withstand years of use, while at the same time retaining an elegant and upscale look. 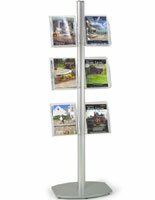 As a free standing display, this exhibition stand can make use of your floor space. 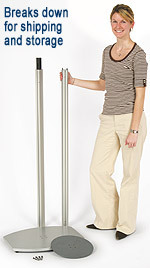 Weighing over 40 lbs, however, it will not fall down, wobble, or move easily, even in high traffic areas. Poster Frame: 24" x 36"
26.3" x 97.8" x 20.5"